Easily grown in any soil. Very ornamental with beautiful flowers. 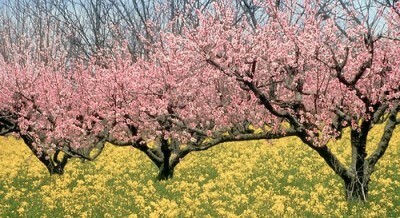 Blireiana - A graceful, small, rounded tree. Grows in height from 15' to 30'. Leaves are reddish-purple in early spring, turning to a greenish-brown in summer. The double flower is large and bright pink with a fragrance. Flowers open early. Tree is very showy. Krauter Vesuvius - Tree has an upright, oval head (more upright than Thundercloud). Grows in height from 15' to 20'. Leaves are dark purplish-black. 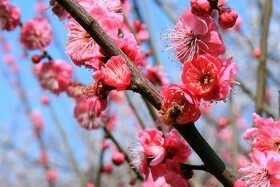 Flower is a single, light pink bloom. 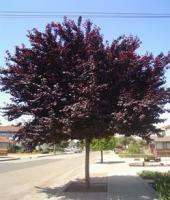 Tree does well in hot, dry climates (image)​. Newport - Small, spreading shrub-like tree. Very hardy and does well in many different climates. Grows in height from 15' to 20' with a spread of 10'. Leaves are purplish-red. Thundercloud - Shape is round. Grows in height from 20' to 30'. 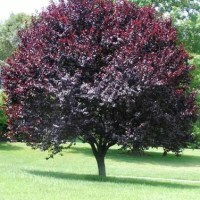 Holds its dark purple foliage all growing season. Flower is white. Also a good fruiting tree ​(image). More adaptable than fruiting peaches. Showy flowers very early. Cold hardy but flowers may be caught in frost. White - Wide, spreading and globular. Double, white blooms. Red - Profuse, double, red flowers. Globular, sparse, pubescent drupe. Peppermint - Flowers striped red and white; may also bear all red and all white flowers on same branch ​(image)​.